If you happen to keep up with me on Facebook and saw my recent post about cassava flour, here’s the recipe for the Gluten and Dairy Free Brownies I promised to share! I know it can be hard to keep track of all the wheat-free and gluten-free alternative flours out there, but cassava flour is yet another one you will surely want to know about. If you are familiar with the clean eating diet guidelines we promote in our book, then you know our family is not gluten or wheat free. However, I know SO many of our readers are and so I try to do gluten free when possible these days. If you are NOT gluten free and you do not want to buy yet another alternative flour, feel free to substitute whole wheat flour (ideally biodynamic) or sprouted spelt flour for the cassava flour. 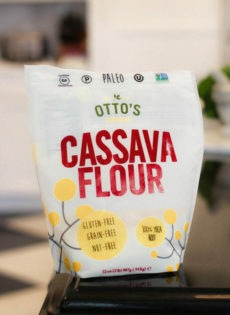 I had NO idea what cassava flour was until just a few weeks ago but it has quickly become one of my favorite all-purpose flours (I’ve been using Otto’s brand). I’ll admit I have not made a wide variety of recipes using it just yet. I have, however, made the recipe for Gluten and Dairy Free Brownies three times —because yes! my family loves it THAT much =) The other recipes I have made using cassava flour have been pancakes and muffins. Everything has been delicious! Cassava flour can be used as a one-to-one substitute for wheat flour in many traditional recipes. It is a “whole food” and single-ingredient gluten free all purpose flour. Made from yuca, cassava flour is a staple food around the world for centuries. Unlike tapioca flour, cassava flour uses the WHOLE root, not just the extracted starch. For those with allergies, cassava flour is a wonderful nut, gluten and grain-free alternative flour. It has a mild flavor and light texture that make it perfect for baking! Although it is not ultra-fiber rich, cassava flour has a healthy 2 grams of fiber per 25 grams of carbohydrate. Cassava is exceptionally high in antioxidant vitamin C compared to many other staple crops (and grains) and a better vitamin C source than potatoes, yams, wheat brown rice, corn and plantains. Cassava flour is a naturally good source of manganese, potassium and folate. Enough chit chat. Let’s make some brownies!! Moist, chewy and SO delicious, these gluten and dairy free brownies are made with cassava flour. They are free of refined sugar. Preheat oven to 325 degrees. Lightly oil the sides of an 8 x 8 -inch baking dish and line the bottom with parchment paper. In a medium size mixing bowl, whisk together the flour, cacao powder and salt. Set mixture aside. To a high speed blender (such as a Vitamix) add the eggs, applesauce, oil, dates, vanilla and syrup. Process on high until smooth and creamy. Add the wet ingredients to the dry and mix well to combine. Stir in the nuts. Pour the mixture into the prepared baking dish and bake for 33 to 35 minutes. Remove from oven and allow to cool slightly. Brownies are best served warm. If you are NOT gluten free, feel free to substitute whole wheat flour or sprouted spelt flour for the cassava flour. Thanks for this recipe! I made it tonight without eggs (I added 1/2 tsp baking soda) and also cut the oil in half (but added 1/2 cup cooked sweet potato)—and they were AMAZING!! I also added a 1/2 cup of chopped raw chocolate chips and they put these brownies into my top ten favorite “treat recipes.” Yum!! Hi Kasey! Thank you so much for taking the time to let me know you liked them =) And what a GREAT idea!! I am definitely going to try adding the cooked sweet potato. Thank you so much for sharing!! 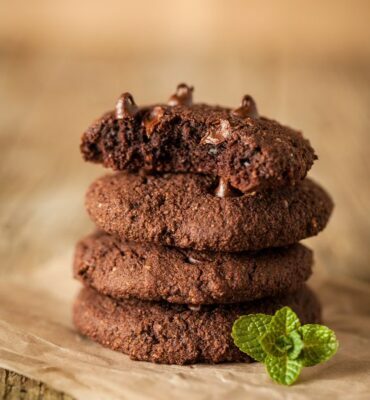 I made your brownie recipe but I uses almond flour instead of cassava flour, they are really good but not too firm, should I have use more almond flour? Hi Francine! I apologize for the lengthy delay getting back to you, I have just been completely swamped ever since the book launch and I just don’t have the staff to keep up. But as for the brownie recipe, my suggestion would be to use a 1:1 ratio of brown rice flour to almond flour. If they still don’t seem like they might not be firm enough when you are making the batter you can try adding 2 tablespoons of almond flour at a time. Please keep me posted and let me know how they turn out!